Image superheroes are lining up to congratulate President Obama, But NOT the villain dictator of New Port City. Bomb Queen is seething with bloodlust when the new administration targets her criminal city for closure along with Guantanamo Bay. 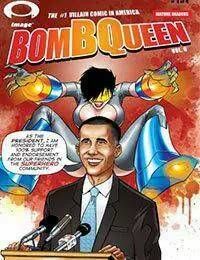 Bomb Queen vs. Barack Obama? Only Image would dare! Dont miss it! NEW STORY ARC! JUMP ONBOARD THE WILDEST SERIES IN COMICS! !